There is a popular misconception that champagne and sparkling wines are only useful for raising a toast or washing down the canapés at a wedding. This couldn’t be further from the truth. For your next celebration take the time to start experimenting with some new ideas that will surprise your guests and open the door to new discoveries that your tastebuds will be forever grateful for. While true champagne (i.e. produced in the Champagne region of France) is usually at least $50/bottle, there are other delicious bubbles that come at a lower premium. Having said that, it is still worthwhile buying the best that your budget can afford, unless you have a hot tip for a cheap steal. French sparkling wine with ‘cremant’ on the label is a creamy style of sparkling wine also produced in France. It is produced with similar methodology to champagne but the grapes come from other regions of France. Cava is the name given to sparkling wine produced predominantly in Northern Spain. It is created using native Spanish grapes that usually present a slightly fruitier style to champagne. There are red varieties of sparkling wine and some can go beautifully with a meaty meal such as duck or lamb. Australia actually produces the largest proportion of available sparkling shiraz. Young examples are usually refreshing, rich, fruity and juicy with a touch of sweetness. Older examples are typically rich and lush in style, and some high quality bottles are suitable for cellaring and aging. Sparkling red offers a surprising texture on the palate and a sparkling shiraz can be a real conversation starter among virgin tasters. For a new angle to a barbeque, try some sparkling shiraz with lamb cutlets. Italy also produces a lot of sparkling red, the best known of which is lambrusco. Lambrusco suffers from a bit of a bad name as a cheap, sweet and even unappealing beverage, however, quality lambrusco does exist. Dry (secco in Italian) examples are available also. In general dry (brut/extra brut in French) sparkling wines tend to match very nicely with oily, nutty and egg-based dishes. Seafood is also a pretty safe bet — and the perfect match for prawns. Chicken can work too, but make sure you take into consideration any sauce that accompanies the dish, e.g. something tomato-based is a no-no, however, light creaminess can still enhance nicely. 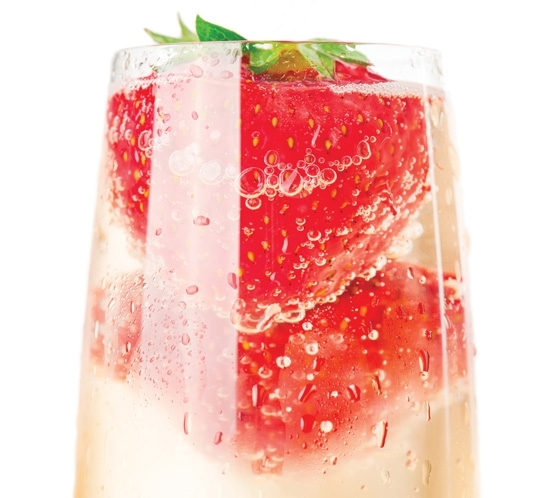 Moscato is a low-alcohol sweet, often pink, sparkling wine. It generally has an aroma of Turkish delight and is a delightful daytime tipple for holiday time. It is a beautiful accompaniment to an afternoon of high tea with delicate sweet treats or even pavlova.